After the shockwave from the Federal Bureau of Investigation (FBI) over the weekend, the chaotic 2016 presidential election campaign, which has been full of scandals and surprises, is now lurching unpredictably towards the finish line. Analysts looking to gauge the impact of the FBI announcement - that it is restarting a probe into Mrs Hillary Clinton's use of a private e-mail server - say events take about a week to be reflected in the polls, so a clearer picture may be available only closer to election day. The only poll to have captured some of the reaction to the FBI review - The Washington Post-ABC News Tracking Poll - shows the contest narrowing to a 1-point Clinton lead, although this alone was not enough to alter forecasts. Also, two-thirds of respondents said the revelations did not make a difference to how they would vote. For now, pollsters suspect Mrs Clinton's lead - an average of nearly 3 percentage points - is large enough to weather the storm from the FBI fallout even if the final popular vote count ends up closer. "At this point, especially with the polling from the battleground states, it's difficult to see how Donald Trump can overtake Hillary Clinton in the electoral college outcome," said University of Notre Dame American studies and journalism professor Robert Schmuhl. "Millions of people have voted and are currently voting, so last-minute stories don't have the impact that they did in the past." To date, about 21 million votes have been cast in states with early voting. Up to 40 per cent of votes are expected to be in before Nov 8. Pollsters generally dismiss suggestions from the Donald Trump campaign that the polling is somehow rigged or deeply flawed. Supporters of Mr Trump point to the polling before the Brexit referendum, which appeared to indicate a slim victory for Britain to remain in the European Union. The actual result was a two-point victory for those voting to leave. But pollsters say there is little to suggest such problems in US election polling. Professor Charles Franklin, director of the highly regarded Marquette Law School Poll in Wisconsin, said the polling so far has had a decent track record. "In the primary elections, the polls had two clear misses, in Michigan for the Democrats and Indiana for the Republicans. But overall, the polls called more primary races correctly than in 2012 or 2008. Also, the support for Trump was estimated pretty accurately by the polls, so there is little evidence from the primaries of any systematic hidden Trump vote not captured by polling," he said. Dr Barbara Perry, director of presidential studies at the University of Virginia's Miller Centre, said presidential polls have not been drastically wrong since they started being done with more scientific rigour. "The ones that people remember are from the time when polling was in its infancy. In 1936, polls were taken by telephone and people who didn't have a lot of money and didn't have phones were not being polled. It predicted that Alf Landon the Republican would defeat Franklin Roosevelt and we know that didn't happen," she said. "I can't think of one that would be equivalent to that in the contemporary era as polls have become more scientific." Researchers similarly dismiss comparisons between US election polling and Brexit. Economist David M. Rothschild, who predicted the correct outcomes in 50 of the 51 electoral college outcomes in 2012, said US pollsters have more reliable data than the Brexit pollsters. "We have historical fundamental data. We have national polling and polling in the states. We have multiple markets. We have forecasted this event year after year, but Brexit was a one-off event," he wrote. Forecasts currently give Mrs Clinton a between 79 per cent and 99 per cent chance of winning. Even with the FBI issue and news that healthcare premiums under Obamacare are set to skyrocket, she enters the final stretch with more money and a bigger ground operation than Mr Trump. And unlike the billionaire, who is keeping a hectic rally schedule, Mrs Clinton is relying on high-profile surrogates like President Barack Obama and First Lady Michelle Obama. Then, there is the problem Mr Trump has uniting the Republicans behind him. Nowhere is this problem more evident than in Utah. Polls in the historically red state show that Mr Trump may lose the state to an unknown third-party candidate named Mr Evan McMullin. Dr Morgan Lyon Cotti, state programme manager at the Hinckley Institute of Politics in Utah, says the events of the past weekend mean Mr Trump cannot be ruled out. "At this point, every battleground state is a must-win for Trump. 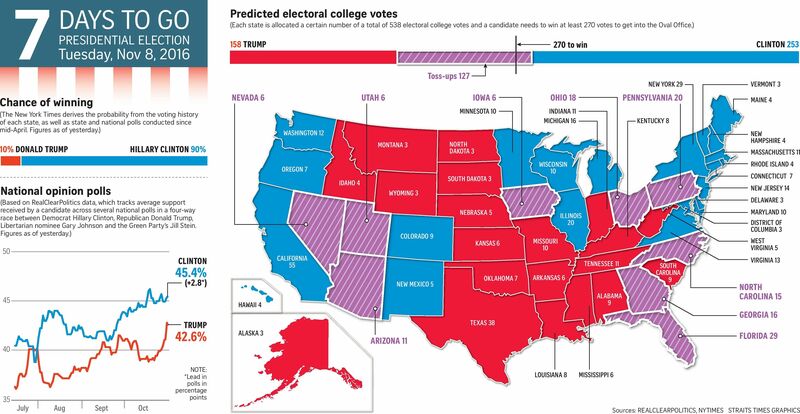 The electoral college map is still in Clinton's favour, but the FBI reopening the investigation into her e-mails shows that this election may be closer than many have expected."